Amazon’s Echo is a key part in building a smart home How Amazon Echo Can Make Your Home A Smart Home How Amazon Echo Can Make Your Home A Smart Home Smart home tech is still in its early days, but a new product from Amazon called "Echo" may help bring it into the mainstream. Read More , and it’s gotten even more affordable with the new Echo Dot. With just a few words, you can order a pizza, turn off your lights, play music, and so much more 7 Creative Uses for Amazon Echo and Alexa 7 Creative Uses for Amazon Echo and Alexa You’ve seen the ads starring Alec Baldwin, but you're still not sure what Amazon Echo does or whether you need one in your home. We’re about to find out. Read More . 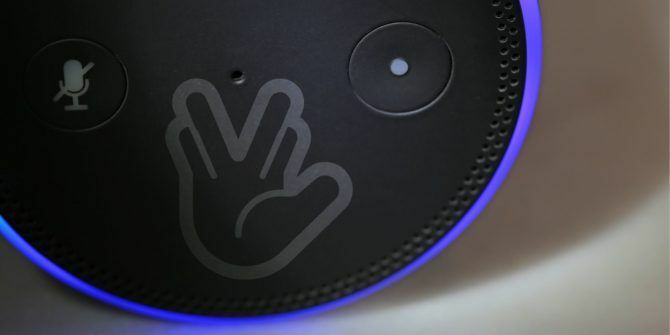 Fans of Star Trek will certainly jump at the opportunity to use the same wake word for their smart assistant that characters in the show used. If you’d like to change your wake word, open up the Alexa app on your iPhone or Android phone. Tap the left slide-out menu followed by Settings. Under Alexa Devices, tap the name of your Echo device to open its options. Scroll down to find Wake Word and tap it to change. Choose from the four above options, then wait a few minutes while your device applies the change. Once complete, you can say “Computer” to wake up your Echo! If you don’t see it yet, make sure your Alexa app is updated. You may have to wait a day or two for the update to roll out if you still can’t change it after that. Just don’t expect your Echo to beam you up. There’s only so much Alexa can do! Don’t have an Echo yet? Check out the differences between the three models Amazon Echo vs. Dot vs. Tap: What Are the Key Differences? Amazon Echo vs. Dot vs. Tap: What Are the Key Differences? One common complaint against Amazon Echo was that it had too many features and cost too much. Amazon's response to that? Releasing two variations with smaller price tags: the Tap and the Echo Dot. Read More . Which wake word do you use on your Echo? Let us know if you’re happy to use “Computer” down in the comments! "Axa" is close enough to "Alexa" to work for my Dot.